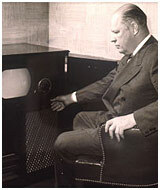 Allen Du Mont, who developed the first commercially practical cathode ray tube for television, is regarded as the founder of the American television industry. In the 1920s he invented and patented high-speed manufacturing and testing equipment that resulted in dramatic increases in receiving tube production. In his home laboratory in 1932, he developed the cathode ray tube, then sold the rights to his “magic eye” invention to RCA for $20,000. He incorporated as the Allen B. Du Mont Laboratories in 1934 and developed and manufactured cathode ray oscilloscopes; his best customer was Ernest O. Lawrence, who used them in atomic research. He became an influential member of the National Television Systems Committee that formulated the standards for the new industry.